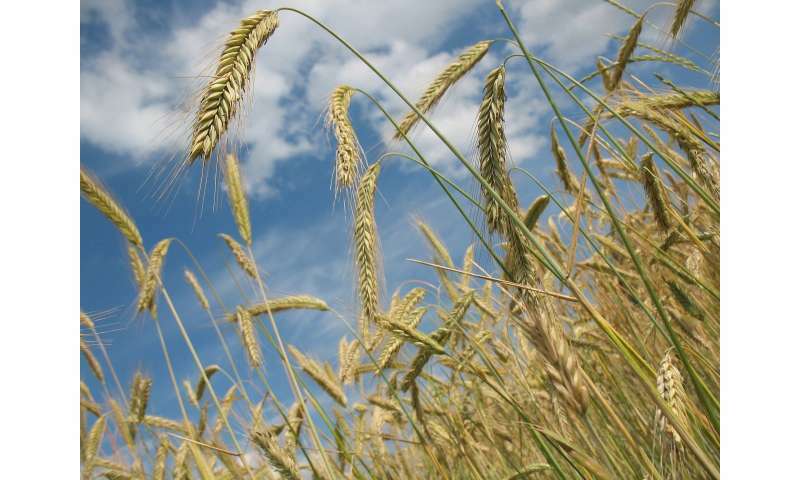 A team of researchers from several institutions in Germany and China has found evidence of domesticated wheat in China around 2600 BCE (Before Common Era). In their paper published in the journal Nature Plants, the team describes their work and its possible implications. Guanghui Dong with Lanzhou University in China offers a New & Views piece on the study. Rice is widely grown and consumed in China, but less well known is that the country is also the largest producer of wheat. Today, scientists would like to know the path that wheat took to get to China. Prior research has shown that wheat was first domesticated in the Fertile Crescent around 8500 BCE. It then spread west into Europe and east into Asia. Some theories suggest the most logical path for the latter was straight east into and across Asia. Others have proposed that it took a more northerly route, while others yet have suggested a more southerly route. In this new effort, the researchers suggest that it was carried east to places along the Yangtze and then migrated west. They do acknowledge, however, that wheat could have been introduced into Asia, and more specifically into China, many times—their findings simply show the likely earliest introduction. They suggest wheat was carried by travelers to eastern parts of China, where it was subsequently planted and harvested. To come to these conclusions, the team performed radiocarbon dating on ancient wheat grains and charred wheat remains dug up in Bronze-Age and Neolithic excavation sites (Zhaojiazhuang and Dinggong sites in Shandong Province), which have yielded artifacts dated back to 8500—to 1500 BCE. According to tests, the wheat samples dated from around 2600 BCE, which predates grains found and tested in other parts of China. The researchers do not know why wheat would have been carried to eastern parts of China, but suggest that it might have represented an exotic crop. There is also the possibility that it was simply exchanged by travelers as part of cultural trade. They do not believe their findings are the last word on the debate surrounding the introduction of wheat into China, however, even if their findings hold up. The next logical question would be which routes it took as it migrated west. Wheat is regarded as one of the most important West Asian domesticates that were introduced into Late Neolithic/Early Bronze Age China. Despite a growing body of archaeological data, the timing and routes of its dispersal remain controversial. New radiocarbon (14C) dating evidence from six archaeological sites in the Shandong and Liaoning Peninsulas and Bayesian modelling of available 14C data from China suggest that wheat appeared in the lower Yellow River around 2600 Before Common Era (BCE), followed by Gansu and Xinjiang around 1900 BCE and finally occurred in the middle Yellow River and Tibet regions by 1600 BCE. These results neither support long-standing hypotheses of a progressive spread of wheat agriculture from Xinjiang or Gansu to eastern China nor suggest a nearly synchronous appearance in this vast zone, but corroborate transmission to lower Yellow River elites as an exotic good through cultural interactions with the Eurasian steppe along north–south routes.